The Blue Marlin is among the largest and most majestic examples of aquatic wildlife. The Blue Marlin is one of the largest and most sought-after species of fish by anglers and commercial fishermen. It is found primarily in the open ocean and uses its impressive bill to hunt its prey. This distinctive marine animal is the star of the Guy Harvey Series 1 Blue Marlin Collectibles! The principal design for Series I of the Guy Harvey silver bullion line is the blue marlin, one of the most beautiful prize fish found in the open ocean. With its long sword and purple dorsal fin, the marlin is emerging from the water, mouth agape, body twisting toward the left, as a group of dorado (mahi-mahi) are fleeing in different directions from the powerful predator. Dorado, meaning “golden” in Spanish, get their name due to their shimmering, golden color. The waves of the sea and the splashing water from the blue marlin’s leap above the surface are shown in great detail, while a tropical shoreline and a cloudy sky fill in the background. Despite having few natural predators besides human beings, blue marlins are currently a threatened species due to their attractiveness to commercial fishermen. 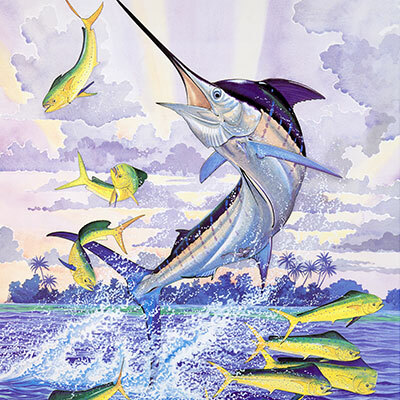 The Blue Marlin have been a favorite subject of the artwork of Guy Harvey. Now, this great naturalist's artistic creations are featured on silver bullion for the first time ever with the Guy Harvey Series 1 Blue Marlin Silver Rounds! Using the officially licensed artwork of Guy Harvey, these 1-ounce silver collectibles are offered in a variety of finishes. You can choose from bullion, proof, colorized, and copper versions of this design. 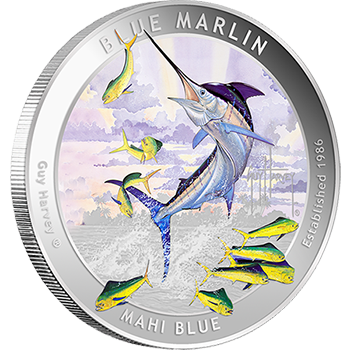 For the classic Brilliant Uncirculated (BU) version of the Blue Marlin design, consider the Guy Harvey Series 1 Blue Marlin Bullion Silver Round. These rounds contain the same .999 fine silver and 1 troy ounce of pure silver content, but use the BU finish seen on standard coins and rounds. Whether this appeals to someone for aesthetic reasons or because they're interested in a complete set of the varieties offered in the Guy Harvey Collection, the bullion finish option is available for extremely competitive pricing. 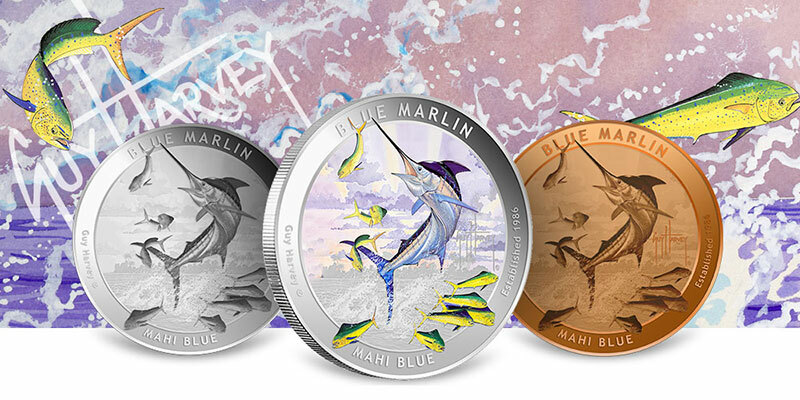 Collectors will be thrilled to find that the Blue Marlin silver round from Series 1 of the Guy Harvey Collection is offered in a stunning proof version as well as a colorized proof! This gives the option for the classic mirrored backgrounds and frosted relief of a proof finish or the vibrant, high-quality color that brings Guy Harvey's dramatic artwork to life. No matter which option you choose, the rounds will be composed of the same 1 troy ounce of actual silver weight (ASW) and struck from .999 fine silver. For collectors who are looking for a more traditional look and feel to this silver round, the Blue Marlin 1 oz Silver Proof uses the popular proof finish seen on many collectible coins. With highly reflective backgrounds against frosted relief, these silver rounds accentuate the beautiful details of the Guy Harvey design. 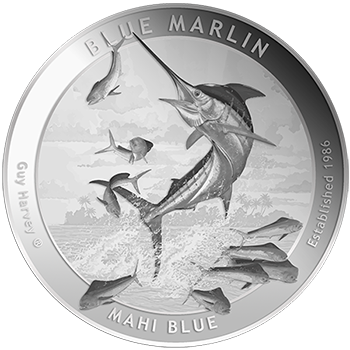 Like the other versions of the Blue Marlin Silver Round, each proof contains 1 troy ounce of fine silver content and is struck from .999 fine silver. 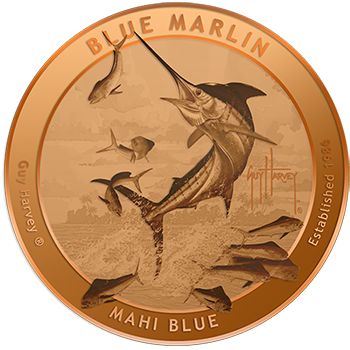 For collectors and investors interested in the Guy Harvey designs who are looking for an even more affordable option, the Guy Harvey Blue Marlin Copper Round is also available. Copper is considered a semi-precious metal and is inexpensive relative to gold and silver. However, it is still an attractive asset to many investors and offers a lustrous surface on which to enjoy the intricate Blue Marlin design. Struck from .999 fine copper, each of these rounds contains a total of 1 AVP ounce (the standard ounce, as opposed to a troy ounce) of pure copper.